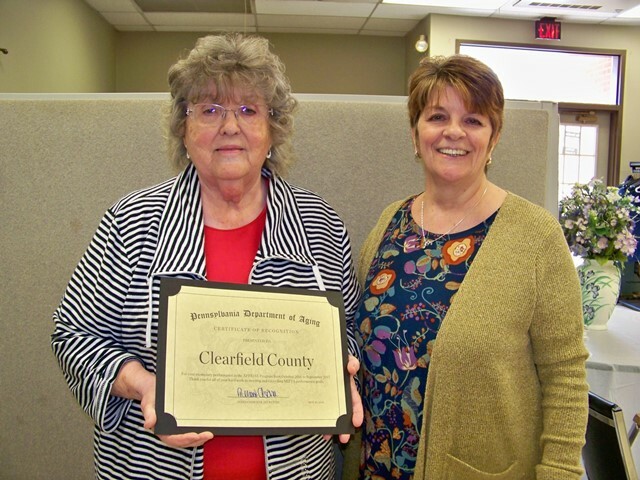 CLEARFIELD – Secretary Teresa Osborne of the Pennsylvania Department of Aging recently congratulated the Clearfield County APPRISE. APPRISE is located within the Clearfield County Area Agency on Aging Inc. It was recognized for its exemplary performance and hard work in meeting and exceeding its operational goals. The APPRISE Center assists consumers with health insurance counseling and answers and helps over 2,000 phone calls from around the state in a year’s time. Pictured accepting the award from the CCAAA was Alice Pollock and Kathy Proud. Programs and services of the agency are funded in part by the Pennsylvania Department of Aging, the Clearfield County Area Agency on Aging, Inc., Mature Resources and local and consumer contributions. For more information about the CCAAA, please visit its Web site at www.ccaaa.net, or call 814-765-2696.